For anyone who has ever wondered about the best chocolate brands, we feel ya. We research some the best-tasting and most popular chocolate bars and put together this chocolate brand review. You’ll be happy to know that you don’t have to splurge on pricy designer chocolates to find something delicious, smooth, and wonderful. Let’s take a look at some of the features you need to know about when shopping for amazing chocolate. 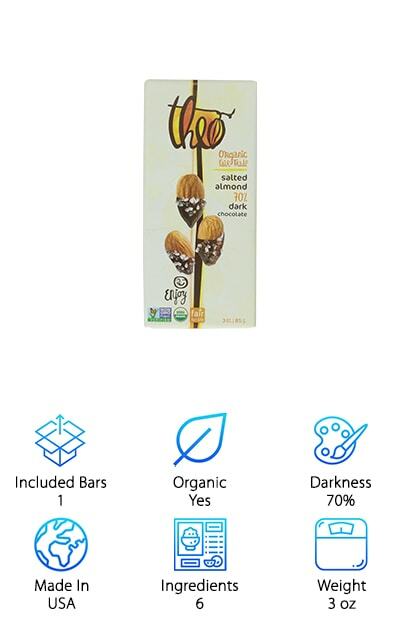 Included Bars - The number of bars you get with each of these products varies. Drastically. Some are for 1 or 2 bars. Others are for more, like 12 or 18. And one even gives you an astounding 36 bars. Organic - If you were hoping to find some amazing organic chocolate, you’re in luck. We found some pretty delicious organic options that you’re sure to love. In fact, 3 of our 10 picks are organic, responsible, and delicious. Darkness - This is how you tell how dark the chocolate is. A lot of our picks are dark chocolate so you’ll see percentages of 75 - 85%. For milk chocolate, this number is lower. In fact, as low as 11%! Made In - All but one of these are made in the USA. The one that isn’t is made by a company in the UK. Something to point out is =the ingredients for these bars are sourced from all over the world. Ingredients - The number you see here refers to the number of ingredients that are in the chocolate. One thing you might notice is that the mass-produced brands have a lot more ingredients than the smaller companies. Weight - Even though these bars come in large quantities, the number for weight is the weight of a single bar. This makes it much easier for comparison purposes. They range quite a bit, too, from around 1.5 to 3.5 ounces. Now that you’ve read out short chocolate buying guide, you know some of the things to look for when deciding on the best brand of chocolate. Let’s move right into our reviews. We put our top and budget picks first so you can get some idea of what’s out there, even if you’re in a hurry. Stick around to the end if you can because all of these products are top notch. Okay, let’s get right to it. 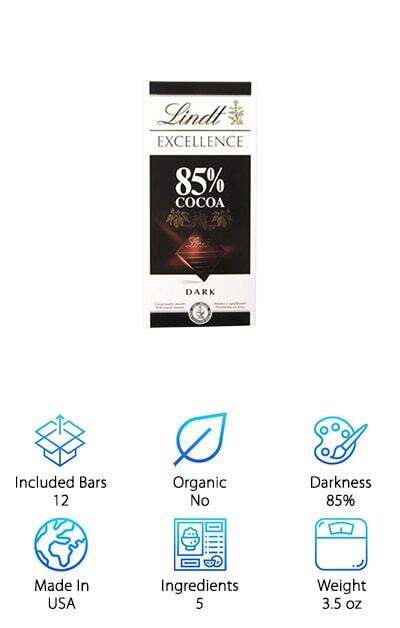 Our top pick is the Lindt Excellence Dark Chocolate Bar. If you’re going to get one of the more expensive chocolate brands, you might as well buy it in bulk, right? That’s beside the point, really, because if you love dark chocolate, this is a great choice. At 85%, it has a lot of deep flavors and stays surprisingly smooth. Plus, it’s made by the Lindt Master Swiss Chocolatiers. They’ve been making chocolate for more than 165 years. Their innovations and recipes make them one of the best chocolate brands in the world. This candy bar is thin by design. Why does this matter? It melts evenly so you can enjoy the layers of flavor as you were meant to. The ingredients are all of the best quality and Lindt controls the production from start to finish. 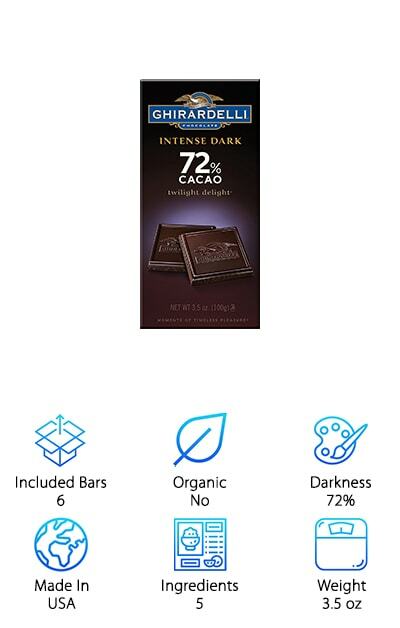 If you’re looking for the best chocolate bars on a budget, check out our next pick, Ghirardelli Chocolate Intense Dark Bar. This deep and velvety chocolate is 72% cacao so if you’re a fan of really dark chocolate, this is a great choice for you. To make sure the chocolate melts evenly in your mouth, these bars are thin so you can get the best experience. In addition to the deep chocolate flavor, you might pick up notes of mocha, blackberry, and dark cherry for a sweet twist. This is a pack of 6 bars so you’re getting a lot for your money. Especially when you consider that it’s made with a special bean blend that features some of the world’s finest cocoa beans. One more thing: these bars are made in the USA. 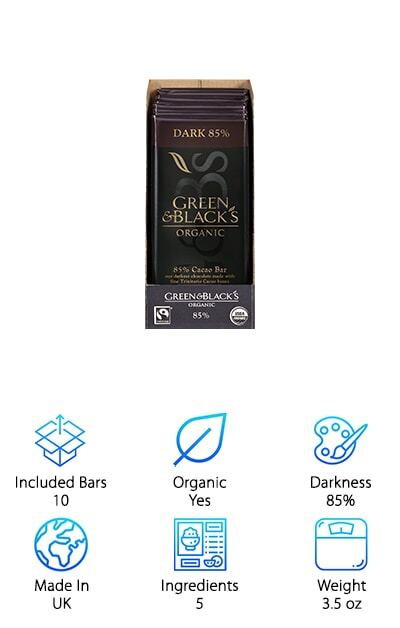 Green & Black’s has one of the best organic chocolate bars we found in our research. Get this: it’s certified organic, fair trade, and uses ethically sourced chocolate. Plus, it’s the only imported chocolate on our list. Every ingredient that Green & Black’s uses a high-quality and organic. For example, they use Trinitario cocoa beans to give this 85% dark chocolate a rich taste. That’s not all. For a bit a sweetness, they add in some sugar, cocoa butter, and just a bit of vanilla. This perfectly balances the bitterness and acidity and adds more depth to the flavor. It also makes the chocolate a little bit smoother. The thin bar melts evenly in your mouth for a unique taste experience. This is a bulk pack that includes ten 3.5 ounce bars so you’re getting deal. 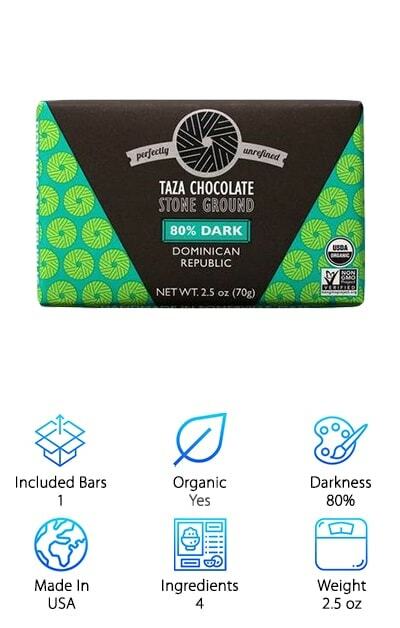 Taza is one of the VERY BEST chocolate brands out there. Their delicious chocolate stands out because it's stone ground, resulting in an incredibly flavor profile. Plus, this high-end treat is organic! Here’s how it works: They stone grind the cocoa beans, which prevents a lot of processing and gives them a unique flavor and texture. If you’re looking for something different and all-around amazing, definitely give this one a try. The unrefined beans let all the natural flavors really shine. And one more thing we love: Taza is an ethical company, too. They source their cacao from farmers who make an effort to respect their employees and the environment. Plus, they maintain direct relationships and pay a premium price that’s above what’s considered Fair Trade. Overall, this is a great company that makes unique and delicious chocolate. We highly recommend it! One of the top chocolate brands in the US is HERSHEY’S. We picked their chocolate bar with almonds because we love milk chocolate and know we’re not alone. 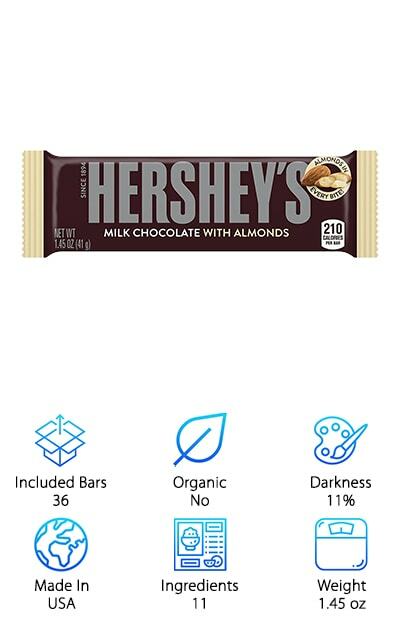 Whereas the dark chocolates we reviews have really high percentages of cacao, HERSHEY’S has only 11%. That’s why milk chocolate tastes so much different than milk chocolate. It all started back in 1893 when Milton Hershey became fascinated with chocolate making and set about developing a great recipe. Prior to this, chocolate was considered a luxury that only wealthy people were able to really indulge in. Hershey made a mass produced candy bar that let anyone experience its deliciousness. These candy bars still fill that niche today. These Chocolate Bars with Almonds are sweet and delicious. This is a bulk pack of 36 bars that’s remarkably affordable. Theo makes some of the best chocolate bars around and we chose the Salted Almond 70% Dark Chocolate for the next spot in our top ten reviews. One of the best things about Theo is that it’s made with all natural, gluten free ingredients and has no trans fats. After traveling in Central America and Africa and falling in love with the people, the company’s founder made it his mission to bring organic cacao to the States. Theo is truly a “bean to bar” company and it shows. What do we mean? These bars are rich and dark but not bitter. Plus, they found the perfect balance of salt on the almonds that are mixed in throughout the bar. This bar is a generous size, too, and will last for a few servings. Most of what we’ve reviewed so far is dark chocolate with one exception. We know that milk chocolate is delicious, too. Especially our next pick, Godiva Chocolatier Sold Chocolate. This is a small 1.5 oz chocolate bar that’s some of the richest and creamiest milk chocolate we researched. 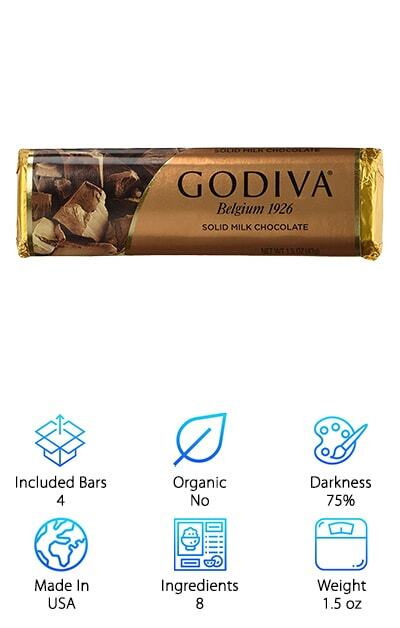 While some milk chocolate bars are mass produced and lose a little something, Godiva milk chocolate bars are creamy and smooth. They have a real chocolate taste, never waxy. We were a little surprised at the depth of flavor in this one. Milk chocolate bars are a lot sweeter than dark and it can be hard to get one that has depth. This one really surprised us. It’s a really nice size bar, too. Not too big so you won’t be tempted to eat more than you should. Another great choice if you’re looking for the best milk chocolate is the Dove Milk Chocolate Candy Bar. 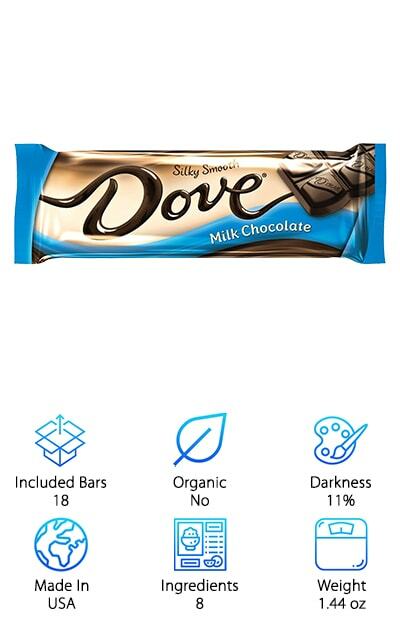 Dove uses quality ingredients including the finest cacao to make this candy bar. Dive is also heavily involved in being a responsible chocolate manufacturer. They’re the largest certified cocoa buyer in the world. They’ve also opened up centers in Asia and Africa where they teach more sustainable farming and help the farmers increase their income. Plus, they use traditional European techniques to roast the beans and bring out the deep flavors. The result is sweet without being overpowering. It doesn’t taste artificial, either. Plus, it melts in your mouth and is rich and creamy without being overwhelming. This is bulk buying at its best, too. What do we mean? You get a whopping 18 bars for a good price. 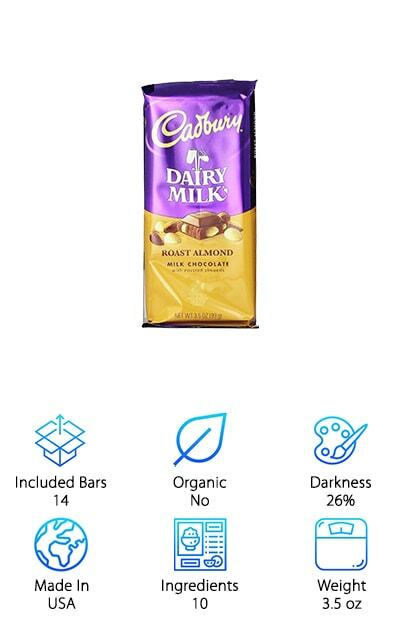 Our last pick for best brands of chocolate is CADBURY and we had to go with the Dairy Milk Roast Almond Chocolate Bar. It’s just delicious. Here’s something we really liked about this one. It’s only 210 calories per bar. That’s pretty good for chocolate. You’ll get a pack of 14 bars with this, a nice amount for a reasonable price. This is a sweet, creamy chocolate bar that isn’t overpowering. It’s 26% which makes it far from a dark chocolate but a little stronger than the other milk chocolates that we came across in our research. This variety has just the right number of almonds, too. The Dairy Milk varieties of Cadbury have been around since 1905. You know you’re getting pure milk chocolate when you see this on the label. You might already be familiar with the Newman’s Own brand. They make a lot of different foods, from salad dressings to cookies to tomato sauces, but here’s the kicker: they donate 100% of their profits to charity. There’s a lot that’s good about this chocolate and you’re going to love the way it tastes. But it’s nice to know that the money you spent is being put to good use. Anyway, on to the chocolate. It’s made from organic beans and, in keeping with their generous reputation, they pay a premium price above what is considered fair trade. 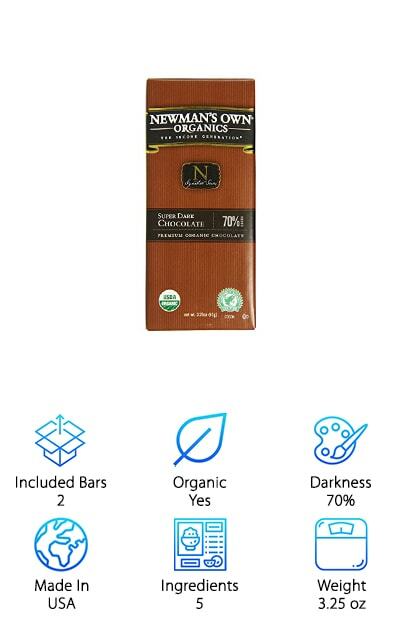 This 70% dark chocolate bar has a rich flavor that’s not bitter and not too sweet.